If you like spooky then, this is a game for you. 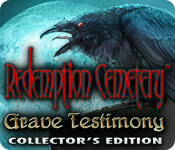 Redemption Cemetery: Grave Testimony is not as difficult as other hidden object games, but the storyline and the interaction makes up for that. 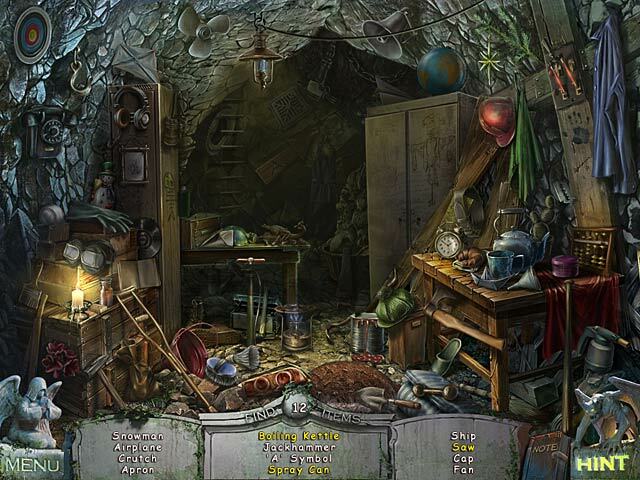 The graphics are colorful, and the game uses live actors to interact with as you play through the game. The narrator’s low ominous voice states that, “sometimes a person can be in the wrong place at the wrong time.” What could be worse than being a witness to a 1930 gangster kidnapping of a millionaire’s daughter? Unfortunately, the gang spots YOU and decide you’re too much of a liability, and may go to the police, which would ruin their chances to get the ransom they are looking forward to. Ahhhh, before you know it, you’re tossed into the back of their car’s trunk and taken to an island where all disappearing witnesses go. Could it get any worse? Of course, it could, the island is cursed. In the midst of being buried alive you hear tommy guns being fired; and when you get yourself free of your shallow grave, you find some dead gangsters. Who did it? Is there someone else on this cursed island? You run to the dock only to find the one surviving gangster trying to take the only boat on the island back to the mainland. Finding a telescope you see that he is having trouble leaving the island, when ghostly hands stretch out of the water, and drag him to his watery death. What to do? What to do? Now comes the meat of the adventure. Apparently there is some bad juju going on, and the dead on the island are restless. A ferryman arrives and offers to take you back to the mainland for the cost of three soul stones. The man brings to mind the story of Greek mythology: The boatman of the river Styx. The boatman is supposedly the link from the underworld aka Hades to the world of the living. You feel the man is shady, but he offers one thing to help you out on your quest to escape the island, a mystical crow. The crow will help you get things out of reach, but you must find a special rune to make the crow turn from stone to living to do your bidding. There are three ghosts you must help to save their souls and the first one will be the gangster shot dead while trying to murder you. Now the fun begins as you must carry out his request, and the gangster sends you back in time, to right a wrong and save his soul. In return, he will give you his soul stone. It is a catch 22 situation, as you must help the souls to get their soul stones. Otherwise, you might as well make yourself at home on the island.The game has beautiful graphics and the live actors lend a bit of a spooky realism to the game. But getting off the island won’t be easy as you must deal with another ghostly figure sabotaging you along the way. The collectors edition of the games comes with a strategy guide and bonus play. Otherwise, you can get it separately if you buy the standard edition of the game, which usually cost less, but does not come with extras the collectors edition provides. Sometimes a recipe is needed to aid in your quest. 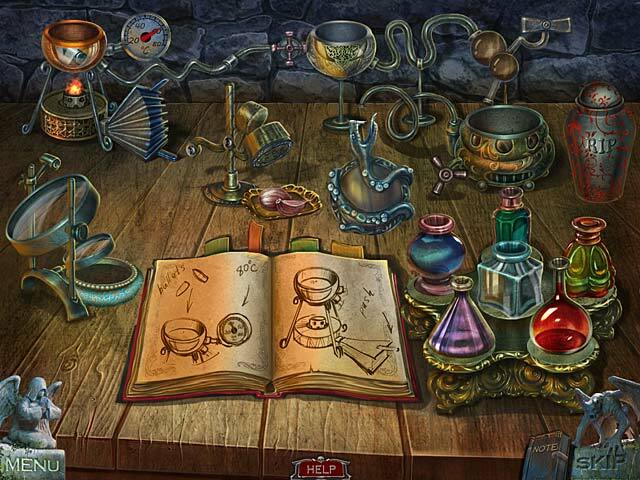 There are several hidden object scenes in which some have you look for certain items to find the next item. 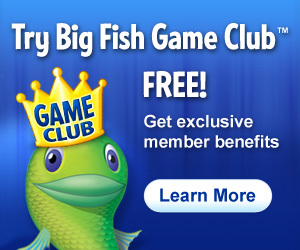 The mini games help in furthering your escape from the island. Make sure you follow the story as it can give you clues to what you need to do to get off the island. This is a great game to play at a Halloween party by hooking up your computer to the television, getting the party guest to join in the fun. This game is available for PC and Mac. This game rates: ♥♥♥♥ out of five hearts. Once again, an interesting review. I like that you deal with the feel of the game. My reviews are more about gameplay etc, but this was established at the outset when I did the CSI reviews, and my Problem and Solutions page. A contact within Ubisoft was giving me some guidance as I was very new to blogging – he suggested that I leave out the personal approach and get down to the points I was making – especially with the P & S blog. Thanks! I get what your saying. I was also thinking about writing my blogs on the games in a more walkthrough kind of way. But in reality I just to inform readers about what’s out there and they can check things out for themselves. I like to give the feel the reader and I are more in a conversation. Can you not change your writing style? Maybe you can do both because I read one your blogs and it was very thorough in explaining the games problems and solutions. Not sure if you got my reply. If you check my latest blog – Grim Tales – TheWishes you will see my style has relaxed a little.